The front-runners, the sleepers, and other potential GOP veeps. The GOP primary is not over yet, but, with Mitt Romney firmly in control of the race, it isn’t too soon to begin asking: Who might he select as his running mate? I recently asked about a dozen Republican insiders who they would want to see on a ticket with Romney. (A couple balked at the notion that Romney was a lock for the nomination, but most agreed it was a logical assumption.) The most striking thing that emerged from these conversations was that some Republicans are a lot more excited about the vice presidential choices than about the presidential ones. “We have more instantly credible vice presidents than we do people running for president,” said Ed Rogers, co-founder with Haley Barbour of the public relations group BGR and a veteran of the Bush-Quayle campaign. Ford O’Connell, a Republican strategist who did outreach for McCain-Palin in 2008, said essentially the same thing: “There is probably more enthusiasm for the potential V.P. pick than there is for the overall Republican field.” Here are the names that came up most frequently during my conversations—listed roughly in order of the aggregate enthusiasm they garnered. Pros: Rubio, the freshman senator from Florida and the son of Cuban immigrants, was named by almost everyone with whom I spoke. Many Republicans think he gives them a shot at winning a significant number of Latino voters, and it stands to reason that he would also deliver Florida, a key swing state. Perhaps most important, Rubio is acceptable to every faction within the GOP: the Tea Partiers, the establishment, and social conservatives. Cons: Rubio doesn’t have much experience and hasn’t been through the natural vetting process that comes with a long tenure in Washington or running in a national campaign. “As Cain reminded us, having been vetted by a campaign is a lot different than five guys asking you questions and Googl[ing] you a lot,” Republican poobah Grover Norquist told me. 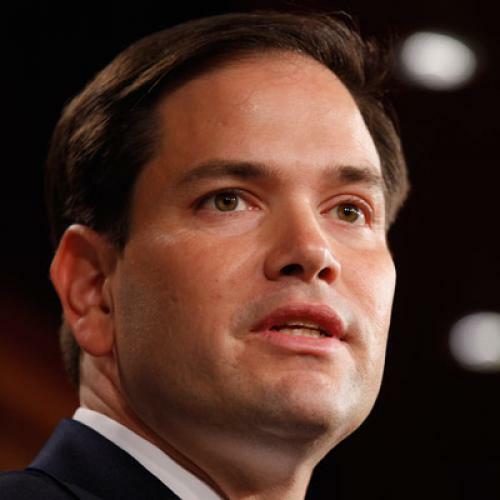 The other problem is that Rubio has emphatically said he is not going to be the V.P. nominee; but maybe he protests too much? Pros: The biggest surprise from my conversations was that Martinez’s name came up almost as often as Rubio’s. The first-term governor of New Mexico is not well-known nationally, but she too seems popular with different factions of the party. Moreover, she could help make inroads with the Latino vote in nearby Colorado and Nevada, and would give Romney a better shot at carrying New Mexico. Pros: After so many Republicans begged him to get into the presidential race, it should come as no surprise that the tough-talking, first-term New Jersey governor was mentioned a lot during my conversations. Christie’s brash persona could be the perfect counterbalance for Romney’s perceived lack of charisma. Cons: New Jersey is a blue state that Republicans don’t expect to win. Plus, Christie—who supports civil unions and gun control—might not be right-wing enough to satisfy the base. “Conservatives do not see Christie as a conservative,” veteran activist Richard Viguerie told me. Pros: The freshman senator from Ohio is a favorite among establishment conservatives. He served as a congressman from 1993 to 2005, then became U.S. trade representative. He also ran George W. Bush’s Office of Management and Budget (OMB) for a while. Portman satisfies many of the criteria one would want in a vice president: He has enough experience to credibly argue that he’s qualified to be president, and he has been in politics long enough that he’s unlikely to have any skeletons. He also happens to come from Ohio, a swing state that Republicans need to win. Pros: Thune, a senator from South Dakota, is popular with social conservatives. It was once thought he might run for president himself, so he is a known quantity and is unlikely to cause any controversy. He endorsed Romney early and campaigned for him in Iowa. Pros: The governor of Virginia was another choice I was surprised to hear. He received fewer mentions during my conversations than the people listed above, but was praised by some key players like Fred Malek, a big fund-raiser for the Republican Governors Association. McDonnell’s most appealing attribute may be his home state: Virginia was one of the places Barack Obama turned blue in 2008, and Republicans are eager to get it back. McDonnell would also play well among social conservatives. Cons: When he was 34, McDonnell wrote a graduate thesis laying out a radically social-conservative vision. (He wrote that working women were “detrimental to the family,” among other offensive things.) During his campaign for governor, McDonnell walked back his statements, but they could resurface to haunt him. Cons: South Carolina is not one of the states in play, and Haley was plagued by accusations of infidelity when she ran for governor. Pros: Sandoval is the first-term governor of Nevada, and, like Rubio and Martinez, he is Latino. His presence on a couple of lists seemed as good an indication as any that many Republicans remain determined to win the Latino vote—despite the nasty tone Romney has taken toward immigrants during the primary. “I have it on good authority that Romney is perfectly capable of shifting, and, to a certain extent, people quite correctly understand that things get said in primaries that is not how people govern,” Norquist told me. Pros: The second-term Indiana governor broke a lot of Republican hearts when he decided not to run for president this year. Only a couple of the people I spoke to put Daniels on their list, perhaps out of wishful thinking. Daniels has impressive experience in the public sector—as a two-term governor and former OMB director—plus private-sector experience as an executive at Eli Lilly. Cons: It was widely said that Daniels decided not to run because he wanted to shield his wife and four daughters from national scrutiny. It seems unlikely he’d change his mind about that for the No. 2 spot on the ticket. Eliza Gray is an assistant editor at The New Republic. This piece appeared in the February 2, 2012, issue of the magazine.